Inspiring Creations: Southern Fabric $25 Gift Certificate Giveaway! Southern Fabric $25 Gift Certificate Giveaway! Southern Fabric is a lovely online shop that has a diverse selection of fabrics from various designers. They have a great selection of pre-cuts, yardage, and they also offer a "Deal of the Day" which is pretty darn hard to pass up! 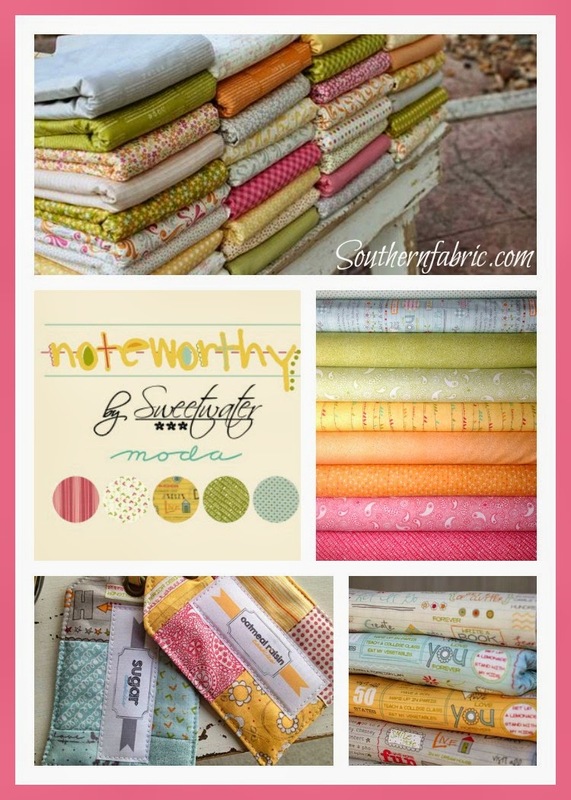 Southern Fabric has a great blog, that is updated regularly! They post their newest sales, tips, and lots of great tutorials. I often find myself looking at their blog so I can shop their newest sales! They always have great sales you can't beat! What is your favorite line of fabric right now? Winner will be chosen at random. Please leave your email address if you are a no-reply blogger! Daydream is so me! I LOVE brights with whites and these prints are so fun! Noteworthy by Sweetwater would be worth looking into! Chance of Flowers is my favorite right this minute. Thanks. I love anything by Riley Blake! I love the bright colors of Daydream too! I am loving Sphere by Zen Chic. Anything by Sweetwater is my favorite, and has been for a year at least. I'm lovin' Mirabelle by Fig Tree Quilts at the moment! My favorite is Kona solids. Thank you for the chance to win. My email is matsche.christine@yahoo.com. The newest of the collections I'm smitten with is Vintage Happy. I don't know that I have a favorite line right now, but I do love dots, chevrons and bright springy prints! Thanks for a chance at the give away. Usually Michael Miller and Blake Reilly but I really like that Day Dreaming you have on the blog! Thanks for the drawing! I'm loving April Showers right now. I'm also hoping April brings us some spring! Thanks for the chance to win. I would some to get some Vintage Happy. I love Iconic by Camelot Fabrics. Thanks! I'd have to say Botanics by Carolyn Friedlander. Thanks for the giveaway! I've been really loving Lotta Jansdotter's new line Mormor! I love Daydream! Thanks for the chance to win! Daydream is so much fun! I love solids - so Kona solids is up there, but so is Comma by Zen Chic. I don't have enough Comma, so I'm on the hunt for some more. Oh boy, my favourite line...there are so many pretty ones out right now. I don't know if Southern Fabric sells this one but I do love Dowry by Anna Maria Horner. I have so many favorites but at the moment I can hardly wait to get my hands on Penguin and Fish's new 'cat' fabrics! I definitely have too many favorites, but if I have to choose the top one would be Sunshine Roses by Tanya Whelan. Thanks so much! 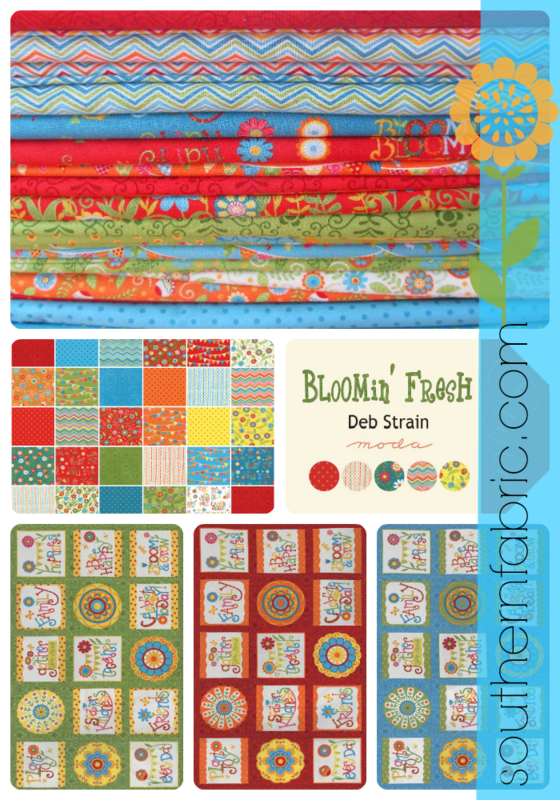 Love the bright colors in Bloomin' Fresh! I love April Showers and Mormor. Thanks for the opportunity. I am crushing on Rapture and Daydream right now. Thanks for the chance to win! 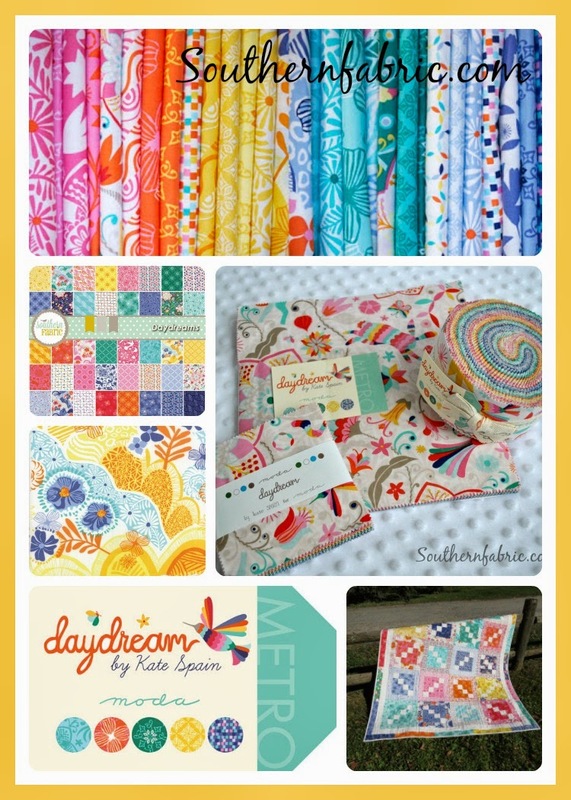 There are many I love….Amy Butler's fabrics and Riley Blake. Thanks for the giveaway. It is April Showers today! Scrumptious! I just finished a baby quilt from this line, it was so nice to work with and the colors are so happy! I like Vintage Happy and a lot others. I love Art Gallery Fabrics. I love "Weeds," I haven't seen it before and I know a High School Rodeo team who would love a quilt made with those fabrics! Kate Spain Daydream! I love it! I really like Honey Bee but also Lori Holt's line to go with the Granny Square's. Honestly I love all fabric, any fabric. I really love Kate Spain's lines of fabric. She creates such great fabrics and colors. They are going to be in my next quilt for sure! I'm loving April Showers by Bonnie and Camille! And I can't wait for their new line, Miss Kate, to come out! Love Valencia by Riley Blake. That is such a great shop. I love anything Kate Spain! Thanks. Love anything from Tula Pink! I am totally in love with Scrumptious by Bonnie and Camille. I can't seem to buy enough of it and have used it in many projects lately. The Nicey Jane collection is adorable for baby dresses! Wow, look at all the lovely comments! I am currently in love with Carolyn Friedlander's Botanics. While perusing Southern Fabric though I came across Soul Blossoms which has so many luscious colors that I love! It's so hard to choose a favorite. I'd love to just mix and match them all up! Those three lines you featured in your post are all very tempting. I would say the Daydreams is my favourite! Thanks so much for sharing the giveaway at the Let's Bee Social, Lindsey. Congrats on the new sponsor! I love the Tula Pink line Fox Field! Thanks for a great giveaway! Critter Patch. It has bunnies! I'm can't wait to Dreamin Vintage by Jeni Baker, it's out next month. So hard to pick just one. Just finished a couple of quilt tops recently using April Showers and Daydream -both are fabulous. I'm eyeing Weeds right now. Looks like a fun collection. The Bloomin Fresh line looks nice! I love the Daydreams line. I'm dreaming that I will win! I have such spring fever right now so today my pick would be Bloomin Fresh. Love bright colors. I'm really loving Tula Pink! LOts of great fabrics, but if I must choose one, Oink A Doodle Moo is really cute. I love giraffe crossing by Riley Blake! Thanks for the giveaway. I love Dowery by Anna Marie Horner. A new one that I really like is Janet Clare's "hearty good wishes". She recently had a pattern published in one of my quilting magazines. Day dream is what I like right now. Botanics by Carolyn Friedlander. Thanks for the giveaway!